Founding Partner H. Hube Dodd left his previous firm after serving as its managing partner and has put together a team of outside counsel with decades of experience in their respective fields. In this way, we are able to tailor our operations to each individual client’s needs, and each client receives exactly the expertise they need, every time. If you are in need of legal assistance, call or email us for a free initial consultation to find out how to put the resources of The Dodd Law Firm to work for you or your organization. The attorneys that work for and with The Dodd Law Firm have been involved in numerous high profile cases, defending former Birmingham Mayor Bernard Kincaid, representing one of the Pharmacies mentioned in the Mitchell Report on Baseball to Congress, and serving as appointed counsel for Olympic Bomber Eric Rudolph. That being said, our core values as a firm revolve around handling our clients’ representation in as quiet and discrete a manner possible. We take as much pride, if not more, in the cases we’ve handled that you haven’t heard of, and always place the concerns of our clients first. We believe that clear and consistent communications are the bedrock foundation of any lawyer/client relationship. We encourage ongoing dialogue in every case and with every client. We believe that our mission is to demystify the legal process and ensure that our clients understand what we are doing on their behalf, and why. The Dodd Law Firm is AV rated, the highest peer review rating bestowed upon attorneys in the United States by Martindale Hubbel, the oldest and most prestigious lawyer rating system in the country. The Firm values this distinction because it derives from our peers, other lawyers who have recognized our abilities and our results. 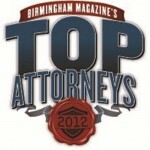 Birmingham Magazine named our Founder, Hube Dodd, one of the preeminent White Collar Defense attorneys and Criminal Defense attorneys in the region as well as one of the Region’s Rising Stars based on a poll of regional attorneys. 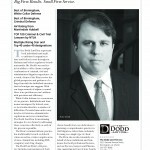 Mr. Dodd was designated a Superlawyer in 2014 after having been named a Rising Star by Superlawyer’s Group and Business Alabama Magazine for the previous 4 years. He recently became the first attorney in Alabama recognized by the National Trial Lawyer’s Association as a Top 100 attorney for both civil and criminal trials. 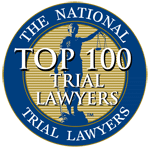 He had previously been named one of the Top 40 Trial Lawyers Under 40 by that association. Mr. Dodd received the Dean Thomas Christopher Award from the University of Alabama School of Law for “Lasting Contributions to that Institution”, as well as the George Taylor Peach award for Trial Advocacy.